From today, all tobacco products in New Zealand will start appearing in standardised, or plain, packages. In this blog, we discuss the importance of developing an on-going monitoring and evaluation plan around this intervention. We also explain why communications with smokers – whether on-pack or mass media – must be salient and timely to have strong and continuing impact on supporting quitting. Achieving all these actions should help to accelerate progress towards the NZ Government’s Smokefree 2025 goal. From today, all tobacco products in New Zealand will start appearing in standardised, or plain, packages. These will feature new, enlarged pictorial warning labels, but none of the brand livery formerly conveyed on tobacco packaging. For decades, tobacco companies have used brand imagery to create connotations that lure young people to smoke while deterring established smokers from quitting and prompting quitters to relapse.1-4 The Māori Affairs Select Committee and Dame Tariana Turia should be congratulated for their stamina, as it is their initiative that has led to the introduction of this important policy, which will reduce the appeal of tobacco products to young people and support realisation of the Smokefree 2025 goal. New Zealand has at least three important opportunities to maximise standardised packaging’s impact: first, by running an intensive complementary mass media campaign that channels dissonance caused by the new packs into quit attempts.5 Second, by developing a thoughtful evaluation plan, and third, by ensuring frequent introduction of new on-pack warnings. Supporting standardised packaging’s introduction with high profile launch activities, such as complementary mass media campaigns to encourage quitting, will heighten the new policy’s impact and maximise the chances that smokers thinking of quitting will make a quit attempt. Representatives from the three countries that have introduced standardised (or plain) packaging recently made presentations outlining their experiences at the World Conference on Tobacco of Health. All commented that, in retrospect, they would have run concurrent mass media campaigns (ideally, linked to the new on-pack warnings) that stressed the serious risks of smoking and benefits of quitting. The Smokefree 2025 goal requires a more intensive and concerted effort, including use of best-practice media schedules to maximise the impact of policy changes.6 7 In addition to standardised packaging, realising the Smokefree 2025 goal will require more comprehensive actions, such as those clearly set out in the Achieving Smokefree Aotearoa by 2025 Plan (ASAP). The introduction of standardised packaging provides an opportunity to increase awareness and understanding of the Smokefree goal, and strengthen support for the goal itself and the measures needed to see it realised. Introducing new smokefree measures is crucial if we are to achieve the 2025 goal; however, evaluating these measures is also vital, not only to check on progress, but also to provide evidence that supports other countries’ health goals. Previously, New Zealand has introduced innovative smokefree measures, though it has not always followed best practice with thoroughly evaluating these. Second, on-going support needs to be given to large cohort studies, such as the New Zealand arm of the International Tobacco Control Study. This study tracks smokers over time and could provide rich insights into how existing smokers respond to standardised packaging.10 Third, behavioural responses, such as calls to the Quitline or contacts with other cessation providers could be studied before and after the policy change, to document quit attempts and the success of these.11 In these areas, New Zealand could follow evaluations undertaken in Australia and collect comprehensive data that tracks how the behaviour of those at risk of smoking, as well as those who would benefit by quitting, evolves. In addition, resources are required for smaller bespoke studies that explore in detail how particular population groups, such as Māori and Pacific, and young adults, respond to standardised packs. Further work could prioritise Māori and Pacific people’s responses to warning images, to ensure these are effective with the groups that bear the burden of tobacco-harms. We also need specific studies examining unintended effects, such as reactance. Maintaining the effectiveness of standardised packaging will also require close management and on-going review. Standardised packaging includes a new set of enlarged and enhanced pictorial health warnings, but the effectiveness of these will diminish over time. To maintain the impact of this important change and reduce the risk of wearout, the Government must follow best practice by regularly introducing new warnings.12 13 No marketing manager would consider using a single communications theme for more than a decade. Yet this has been the approach taken to date in New Zealand; the pictorial warnings introduced in 2008 have presented the same health risks for ten years, albeit using a rotation cycle. The Government must not make this mistake again with the new standardised pack warnings. New Zealand needs an ongoing programme of warning development and implementation so tobacco packages feature multiple images corresponding to a single warning message. For example, lung cancer may mean tar-soaked lungs, laboured breathing, loss of time with family and whānau, or unheard stories. 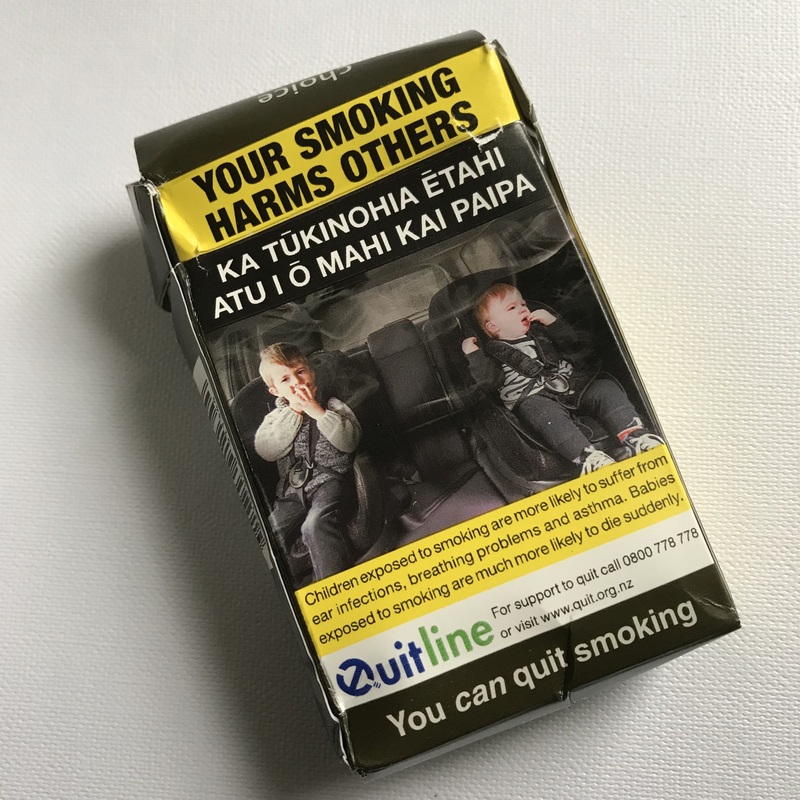 On-pack warnings need to illustrate these different realities, with particular thought given to Māori and Pacific smokers, to ensure warnings resonate with different groups of smokers, particularly those most affected by the harms smoking causes. We should expect similar positive responses to those observed in Australia but need to plan now so we maximise impact achieved, monitor how responses track, and have strategies developed to sustain the desired effects. We congratulate those who led this important initiative, particularly the Māori Affairs Select Committee and Dame Tariana Turia, and call on the Government to take two key steps. First, ensure we gain maximum impact from standardised packaging by adopting the strategies outlined above, and second, integrate standardised packaging with the much broader agenda carefully scoped in the ASAP report to accelerate progress to 2025. Gendall P, Hoek J, Edwards R, et al. A cross-sectional analysis of how young adults perceive tobacco brands: implications for FCTC signatories. BMC Public Health 2012;12(1):796. Wakefield M, Loken B, Hornik R. Use of mass media campaigns to change health behaviour. Lancet 2010;376(9748):1261-71. Yong H-H, Borland R, Hammond D, et al. Smokers’ reactions to the new larger health warning labels on plain cigarette packs in Australia: findings from the ITC Australia project. Tob Control 2015:tobaccocontrol-2014-051979. Young JM, Stacey I, Dobbins TA, et al. Association between tobacco plain packaging and Quitline calls: A population-based, interrupted time-series analysis. Med J Aust 2014;200(1):29-32. Gendall P, Eckert C, Hoek J, et al. Estimating the effects of novel on-pack warnings on young adult smokers and susceptible non-smokers. Tob Control 2017:tobaccocontrol-2017-053719. Gendall P, Hoek J, Gendall K. Evaluating the Emotional Impact of Warning Images on Young Adult Smokers and Susceptible Non-Smokers. J Health Communication 2018:1-8.